I saw this idea several years ago and have wanted to try it ever since. This was the year! 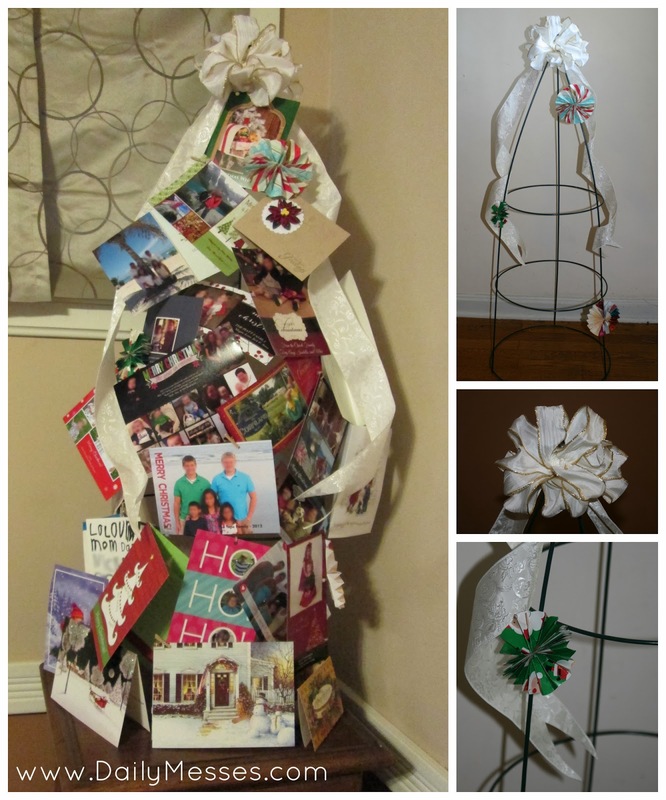 It is super easy to make and the kids get to look at all the cards, while my mantle stays organized and clean. 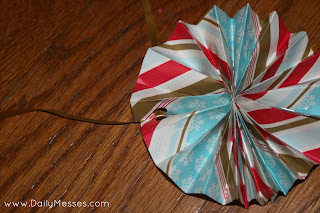 I made paper fan ornaments from scraps of wrapping paper for decoration (see below for directions). 1. Place the tomato cage so that the points are pointing up. 2. Gather the legs together and hold in the middle. 3. 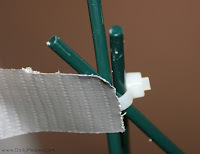 Wrap zip tie around all three spokes and tie shut. Make sure it is as tight as it will go, so it will not pop off. DM Alternative: You can also hold together with Duct Tape. 4. Optional: Decorate the top with a bow. Add ornaments to the tree. 5. Attach cards as you receive them! You can simply hang over the wires, punch a hole in the card and tie on with ribbon, or use mini clothespins to attach. 1. 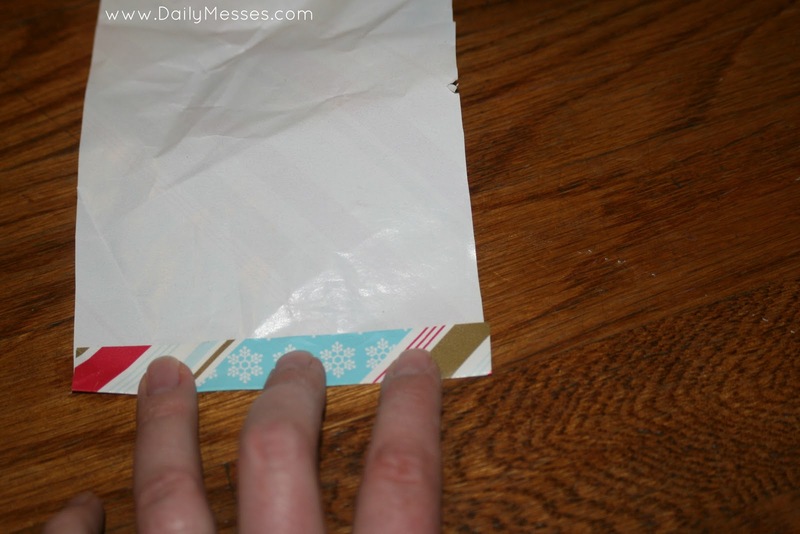 Cut a piece of wrapping paper. The width should be double the height. I cut a 4 inch by 8 inch piece of paper. 2. 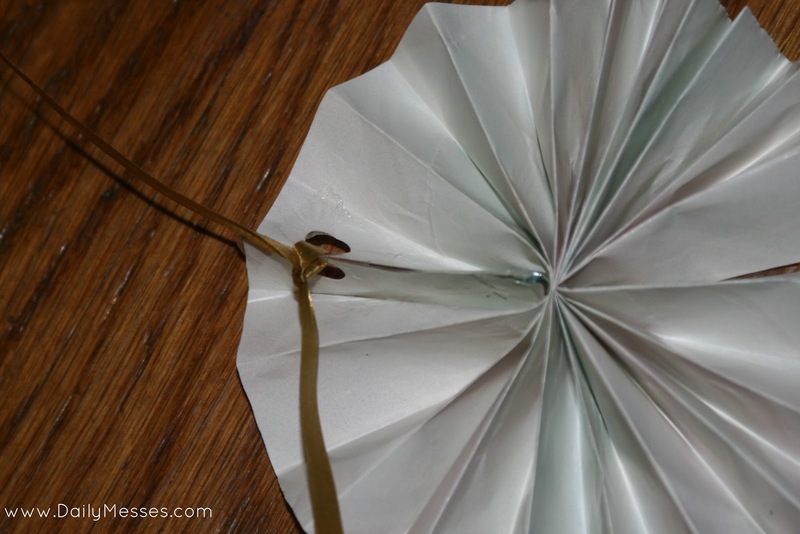 Fold over into small pleats to create the fan. 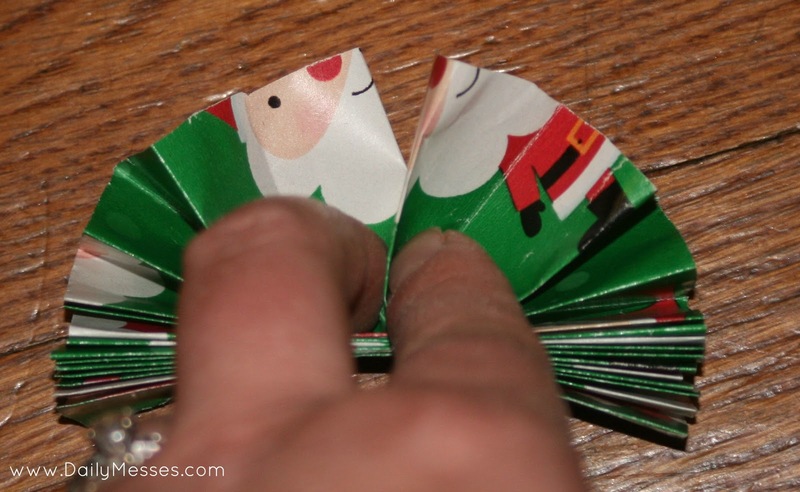 Fold all the to the end of the paper. 3. Place a staple in the middle. 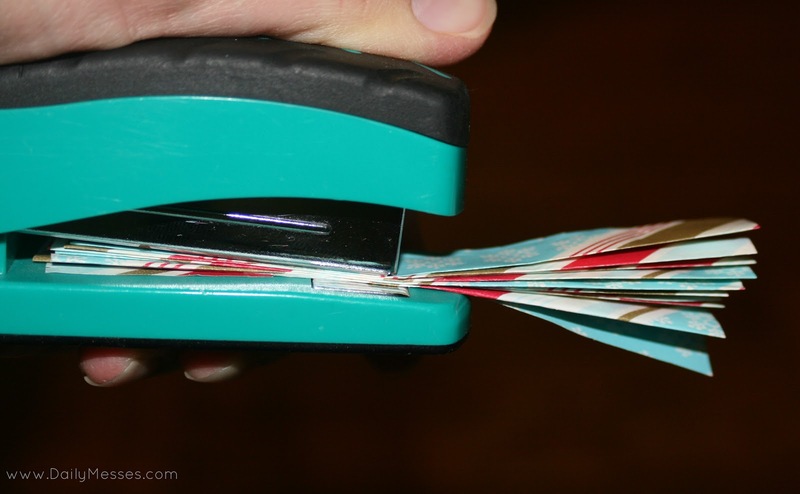 If possible, staple vertically. 4. Unfold. Tape an end from the left side to an end from the right side. 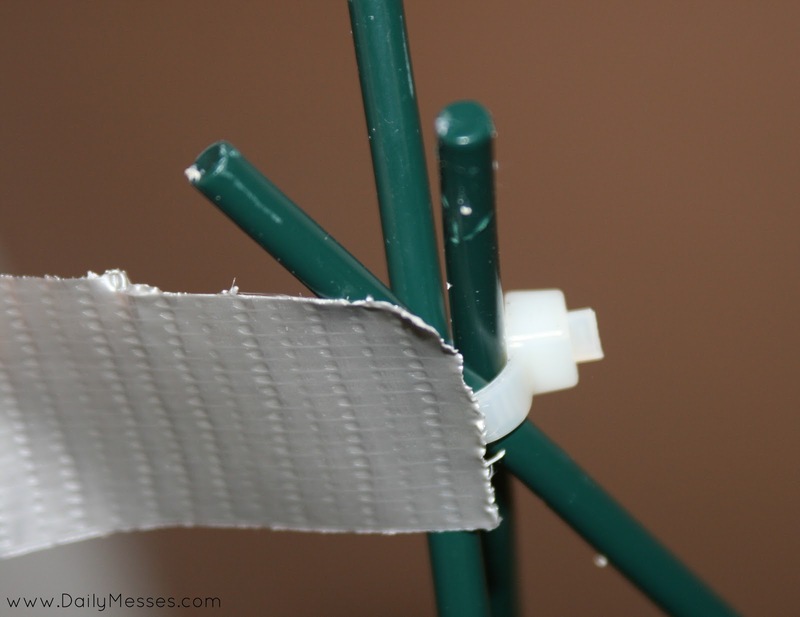 DM Tip: If you have uneven edges, just trim before taping! 6. Punch a hole in the top of one of the pleats and tie on a ribbon. 7. Attach to a tree, presents, etc. DM Tip: I tried this with cardstock, and it did not turn out as well. Thinner paper works better!